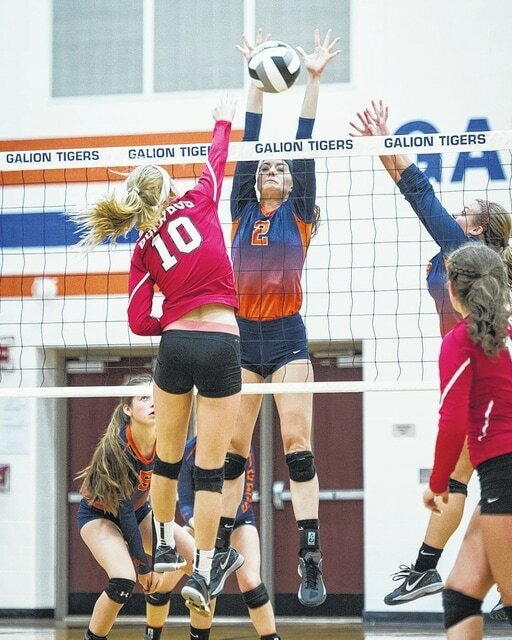 GALION — Galion’s volleyball team hit the court Wednesday evening determined to keep their 2016 season alive. The Bucyrus Lady Redmen came into town with the same vision in a Division II sectional tournament showdown. It was Galion that emerged victorious to continue on, winning 25-22, 25-22, 25-17. The action was back and forth all night. Galion and Bucyrus were constantly trading off kill attempts, blocks, digs and everything else that makes the game of volleyball entertaining. The Tigers serving game was top notch against the Lady Redmen. Leading the way was Nicole Thomas, a perfect 17/17 on her service attempts while earning 10 points in the victory for Galion. Seniors Chloe McCleese and Callie Wildenthaler were strong in their final game at home. McCleese was 14/14 serving with eight points and one of three Galion aces while Wildenthaler went 14/14 with seven points. Marisa Gwinner continued her strong serving on the year by adding eight points and an ace on 11/12 serving. Morgan Gregory tallied the third Galion ace. Gwinner also led the team in kills against Bucyrus. Gwinner was 27/31 on her attack attempts, recording 20 of the Tigers’ 47 kills. McCleese was also busy at the net, going 35/40 striking with nine kills. Senior Dusty Thomas was also a big contributor to the Galion attack, finishing her final home game at 17/19 hitting and notching eight kills. Gregory was 101/103 setting up the attackers and grabbing 42 out of 43 assists. She is just four assists away from 700 on the season. Galion played strong defensively to help itsseason continue onward. As a team, the Tigers tallied 60 digs to thwart the Lady Redmen attack. Wildenthaler dug out 25 attacks on the night to push her season total over 300 digs. Nicole Thomas added 15 digs and Gregory an additional nine for the match. At the net, Gwinner shut down Bucyrus with three total blocks. She was aided in her efforts by Gillian Miller and Kelsey Redman with two blocks apiece while Gregory tacked on a block of her own. The Tigers had four solo blocks and two assisted blocks officially. With the victory, Galion advances in the tournament and improves to 9-14 on the season. The next task for the Tigers will not be an easy one. On Saturday Oct.22, they will travel north to play the Huron Tigers. Huron is ranked 19th in the state and has an impressive 20-2 record. They have needed just 65 sets to get to the 20-win mark, as they have won 58 sets and lost just seven. The action in Huron will start at 3 p.m. on Saturday.